I was a bit impatient whilst working on the neck, and I decided it was long enough when it was about 3 inches shorter that I had originally intended. I do like the neck this length, more of a polo neck (I believe it’s called a turtle neck in the US). On the subject of terminology, since I started knitting I have got into the habit of using the term ‘sweater’ rather than ‘jumper’. I think this is because it is a term that is understood on both sides of the atlantic, whereas I believe that jumper means something entirely different in the US. 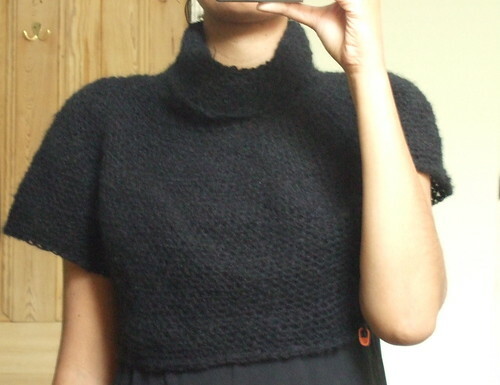 Anyway back to the ‘cowl’ neck ‘sweater’ – It’s my own design – top down, round yoke and will be a loose fit hip length with slightly A-line body and 3/4 sleeves. It’s really easy work, just round and round in double (= US single) crochet. So far it’s taken about 2 balls of Sirdar Blur. Pretty, pretty yarn! Welcome to the addictive world of blogging.